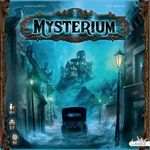 This GeekList will reveal the answers to the different #Tweetsterium boards shared throughout #GenCant. All answers are hidden in a spoiler tag. I've also shared a few notes on what the clues were trying to hint at. Yes - you'll be able to use this list to "cheat" but really, why bother? I hope you have fun with #Tweetsterium! Did you guess correctly? Which clues were toughest? Solving the suspect - was it tough? It was difficult to clue! which one was the hardest to solve? The weapon was very difficult to clue and seems hard to answer. It'll be interesting to see who gets it. I hope you enjoyed playing #Tweetsterium!